I asked several clients to help me do this weighted vest for osteoporosis review. We took a bunch of vests that we had, each person tried them and then we had each person provide a personal weighted vest review. In addition, I provide my recommendations for the best weighted vest for osteoporosis. Your build (do you have a long or short trunk?). Your concern about the look (some are more stylish than others and can be worn in a public setting such as a grocery store). How much weight can you bear? Most of the weighted vests I examined supported 4 pounds of weight although several will go to 8 pounds. You need to determine how much you need and can comfortably carry. Recently, I tried five different weighted vest for osteoporosis exercise. Here is my review of each brand. Prices are quoted in U.S. dollars unless indicated otherwise. But … Please confirm price points with the vendor! If you have used either of the weighted vest for osteoporosis exercise reviewed below or others I have not covered and want to share your experiences, please use the Comment box at the bottom of this post. Please share your ideas and personal experiences. If neither of these vests works for you, consider the IronWear Women’s Vest. I strongly recommend either of these weighted vests for osteoporosis. Between the three, you will have to choose the one that you find most comfortable and meets your budget. I invited two of my clients, Aline and Farida, to try all of the vests and comment on what they liked and disliked about each one. I was surprised at the diversity of comments. Note that the preference for a vest depends upon body type and personal taste. Margaret: Welcome to MelioGuide. Today what we’re going to do is do an evaluation of different weighted vests. For this evaluation, I’ve asked two of my clients, both of different statures to come and join me in evaluating which they thought was their favorite or least favorite, or at least to give me their opinion on the vests. So here goes. Weights are coated iron plates. All weighted vests are long. “Small weighted vests” are too long for someone under 5’4”. The construction could be better. One of the snaps broke off the day I received it. Weights are potentially uncomfortable if you have wide hips and a short waist. Weighted vest is fairly attractive except for the large logo. 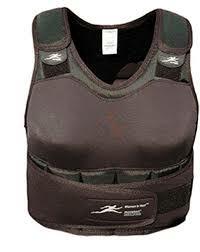 Costs: $69.95 for weighted vest plus shipping. Price includes 4 pounds of weights (8 times ½ lb) and a CD. Note to Canadians: Add $34.00 to $39.00 for shipping. Aline: This is my favorite vest. It feels comfortable. I like the distribution of the weight all around my hips. I can wear clothes under, and I can even wear my winter coat on top. It’s really very flexible and I can adjust it. I just loosen the belt a little when I wear a little jacket. If I just wear a T-shirt in the summer I just tighten it. I can wear this in the winter or the colder weather with another jacket on and it’s very comfortable. Farida: There are four or five weighted vest for osteoporosis that we’ve been trying on and off. Not that any of them is my least or favorite because I can find positive and negative qualities in each of them. This particular one, the positive thing about it is that the weights feel comfortable on this one around the hips. However, the fit for me with a shorter frame is actually not a good one. I feel as if it’s hanging a little bit too much down below my waist. If I were taller it would actually fit more comfortably. One negative aspect is this little tie or rather closure that is a distraction. However, it’s not an issue necessarily if you like the rest of it. That’s right, it can be cut off. As far as appearance is concerned, it’s very attractive but again, if you’re also looking for fit, it’s way too big for me. Margaret: The Walkvest is the least favorite of mine but not by a lot. The two key reasons that it is the least favorite for my stature being five foot two, the small is just really big. So even with making the belts as tight as possible, I still find it a very loose fitting vest. I’m not a huge fan of cotton. The buttons, it does bother me when I invest a lot of money in a vest that the buttons start to fall off. Although it doesn’t affect the function, it’s just an indication of quality for me. Lastly, I really don’t like being a walking billboard. The WV on the front and on the back, although it has a nice reflective quality to it, I would rather it just be a stripe. The type of material varies depending on the style of weighted vest. NYCNYK vest for osteoporosis is a weighted vest made of neoprene and a different weighted vest made of a quilted fabric for the spring and fall season. Weights are bars. I was unable to determine the material used to make the weights. Depending on your individual taste, the weighted vest could be stylish enough to wear when doing errands, etc. Bars are roughly finished and have pointed corners. The small weighted vest accommodates 4 pounds. Farida: The NYCNYK vest for osteoporosis is probably, along with the other red vest, my favorite vest. It feels comfortable. I do like the texture of this too. It’s not quilted or heavy looking either. I think in terms of appearance it looks good. The weights around my waist feel very comfortable. This vest accommodates four pounds normally. There are these flat plates of which we don’t know the material. However, they’re a little bit sharp on the edges, and if you try to double up, I think you might stress the material of the vest itself. However, they are flat, and they do feel less bulky around your waist than some of the other vests do because of the fact that they’re flat. If you knew that you were going to go with 8 or 12 pounds or increase the weight in your vest beyond the capacity of this one, then it probably won’t be the vest for you. But really it is a very comfortable, good looking vest. Weighted vest is made from a stretchable cordura and is washable. Weights are lead beads in individual one-pound pouches. Pouches are made of canvas and have a lip for easy handling in and out of the pockets. Stylish enough to wear when doing errands, etc. The small weighted vest accommodates up to 16 pounds. The staff in Utah are very friendly and will ensure to send you the best suited for you. Costs: $125.00 plus shipping. Price includes 8 pounds of weights (8 times 1 pound). Note to Canadians: Shipping was $27. In addition, I was charged an extra $20 for HST (in Ontario) by the delivery man. This made the weighted vest a bit too pricy for me. Aline: Well, of all the vests that I’ve tried this is my least favorite. The main reason is where the weights sit on my hips. I find that it’s too heavy on my hip bones. Also, the beanbags don’t spread the weight properly. It’s dragging me down. With regards to the look of the vest, I really wouldn’t mind wearing it. I think it’s fine. What’s more important to me is how it feels while I use it. Farida: This weighted vest for osteoporosis is one that I consider a proper fit for my height, weight or shape. The fact that the weights are down here is a good feeling. My preference would be for weights higher up. However, this is a very snug fit. It fits well so appearance wise it’s something that I would wear very readily with just a T-shirt. Again, this does allow for putting on a jacket in the winter. I think it’s actually quite versatile in that respect. The fabric is a nice one. It doesn’t really feel as thick as a couple of the other vests which give you that heavier look. In that sense it’s more attractive. The MiR Weighted vest for osteoporosis is one of my favourites and I highly recommend it to my clients. The MiR Women Adjustable Weighted Vest is available on Amazon. Weighted vest is made of 1200 D-Nylon compressed and is washable. Weights are solid iron bars. Belt is made with soft but strong enhanced rubber. Adjustable straps around the shoulders and bottom of the weighted vest ensure that it will not move or shift. It looks like a workout weighted vest and would appeal more to men and younger athletic women. Belt is one size fit all. Smallest circumference is 32 inches. 30 days money back guarantee and 60 day exchange policy. MiR Air Flow Short Vest with 10 pounds of weight is $129.95. Maximum weight limit is 50 pounds. Women Adjustable weighted vest with 10 pounds of weight is $89.99. Maximum weight limit is 30 pounds. Belt with 10 pounds of weight is $89.95. Maximum weight limit is 36 pounds. Weights are also sold separately. Farida: This vest is probably the most unique looking one of the collection that we have today. However, there are many pros and cons for me particularly as a small-statured person. I find it extremely bulky and don’t really like the idea of having this much girth. I also think that the weights for me are not on my waist and they’re not on my chest, so they’re a little bit in between. I’m very conscious of the weights as opposed to being able to walk or not. The heaviness of it. Margaret: This is my favorite vest for two reasons. The first reason is that I can start low. Each weight is three pounds. It can then build up to 32 pounds which for the majority of you listening to this is far more than you’ll ever need. In my case, I have a husband and a son that like to work out. All of a sudden, if I’m going to invest in a vest, invest in a weighted vest, it’s really nice to invest in one that they can also use. My 15 year old thought it was great and he had it on working out last night. Certainly he can comfortably wear it up to 32 pounds for his training when doing his squats and lunges, whereas I am going to be more comfortable keeping it to the 15 to 21 pound range. That’s one of the reasons. The second reason is it’s very very durable and I know it will last a lifetime. The investment is well made. It has a lot of adjustments in terms of the belts, the fit as well. So I guess there’s three reasons. I do like the fact that the weight sits close to the shoulder blades, where you could start it here and then lower down because that does help with the alignment. Those are the reasons that I’ve chosen this vest, the MIR as my favorite vest. Weighted vest for osteoporosis is made of a breathable nylon. The weights are made of lead pellets encased in plastic and then nylon – giving them a softer feel than regular weights. The small size holds up to 10 pounds, medium and large size holds up to 16 pounds of weight. Padding is provided under the weights in the shoulder region for added comfort. Weights sit just over the front of the shoulder and in the mid to upper back. The position of the weights encourages improvement in postural alignment. The long weighted vest would appeal more to the 60 plus age group – while the shorter one might have more appeal with a younger group. Costs: $132.00 includes 10 pounds of weights. Note to Canadians: Add $20.00 for shipping. Farida: This is a very interesting vest because I find that it looks quite different from the ones that we’ve been looking at in the collection. It’s lighter in many respects in terms of the fabric. I think that it accommodates the weights for me more comfortably because they’re higher. There’s nothing that’s adding girth to begin with, but also fitting tightly around the waist. If you’re worried about that, it might not be the one for you. The negative aspect of this though, the more negative aspect, is in terms of the fit, it’s very loose. In terms of the fabric, I think it’s probably the least durable. It does look quite untraditional and may appeal to many women. In fact it does appeal in terms of a different kind of style because I think it shows a little bit of the sides which also allows for walking more comfortably. The weights as I was saying are the positive things about this vest. I think I would buy this primarily because I feel the most comfortable walking in this. I’m not conscious that I have on a vest walking down the street if I choose to wear it outdoors. Margaret: As you’ve noticed, different individuals based on what body part they are either wanting to accentuate or to hide, their stature, their height, how much body fat they have, in terms of the weights being hard and sitting on their pelvis and they’re feeling the weights. All of those things play a role in choosing the vest that you feel is the best vest for you. Although I’d like to make a recommendation for each of you, I can’t do that. This is the closest I’ve come to giving you an answer to the many questions that came my way after I wrote the article on the weighted vest. Hopefully it allows you to choose the best vest for you. There are a wide range of weighted vests on the market today. What are Is a weighted vest the right thing for you to purchase? Are there any weighted vest exercise benefits you should be aware of? The article reports on the effects of a twelve-week exercise training program using weighted vests on bone turnover and isokinetic strength in a randomly selected group of postmenopausal women. The intention of the study was to design an exercise-training program of progressive resistance that could be easily adapted to home and community settings, and, at the same time, diverse (and interesting) enough to appeal to a large number of postmenopausal women. The program was composed of exercises that do not require the use of specialized machines or free weights. Bone resorption (breakdown) decreased significantly. Bone formation activity was unchanged. There were improvements in percentage of body fat, fat free mass, and ankle plantar-flexor strength. 80% of the group stayed on the exercise program throughout its twelve-week duration. A weighted vest would be a great alternative or adjunct to holding free weights during your exercise program. How heavy should the vest be? The study demonstrates that there are significant benefits if you progressively increase the weight in the vest. An initial weight of 3% of your body weight is a good start, eventually progressing to a maximum of 15% of your body weight. Which exercises are most suited to wearing a weighted vest? It would also be a good adjunct to a walking and balance training program. Our Exercise for Better Bones Program is available and we encourage you to check it out. A reader contacted me recently with several questions and I provide some weighted vest for women tips to help her use her vest pain free. Weighted vests are popular with women who want to incorporate weight bearing exercises into their osteoporosis exercise program. Since publishing my reviews of weighted vests, I have received questions on the specific use of the vests. Some people find weighted vests can cause discomfort when used during their weight bearing exercises/activities and strength training. Recently, a reader contact me about shoulder pain she experienced when using her weighted vest while walking and asked me for some suggestions on how to deal with the pain. Ruth lives in Kentucky and is a reader of my blog. She has followed the weighted vest reviews and reached out to me with her question. I anticipate a number of other people experience the same problem as Ruth. I have osteoporosis (more severe in the hip) and am very interested in the weighted vests and watched your video. However, I have experienced a problem with a weighted vest. The downward pull of the vest exerts a strain on the shoulders after a while of walking — at least, it does with my vest (mine has 10 lbs of weights). I have had to stop wearing my vest because of injury to my shoulder. I started using weights strapped around my legs instead, but was told not to do that either. My question is: How do you avoid the drag on your shoulders that it seems to me all weighted vests (even lighter ones) would cause? Good question, Ruth. I decided that I could best address your question with a show-and-tell video. I have also provided the key points that I made in the video in this blog. You will find the video at the bottom of this page. There are three things Ruth can do to address the shoulder pain caused by her weighted vest. I encourage her to consider all three. Be careful how you load your weighted vest. Make sure you maintain a good posture. Consider a weighted belt as an alternative. If your weighted has front and back pockets to accommodate the weights, I suggest that your place the weights in the back pockets first. Then, counterbalance with equal amount of weight in the front pockets. This will help you obtain proper postural alignment. Some vests have high and low back pockets. If your vest does, start loading the high pocket first since this will encourage an upright alignment. Stay in optimal postural alignment. If you have a forward lean (a slouch), do not load the front of the vest. Only load the back of the vest to encourage you to straighten up. Make an effort to actively use your postural muscles to lift against the weights. Since Ruth has concerns about building bone at her hip, she should consider a weighted belt. Like the weighted vest, the belt allows you to load gradually. You should start with a low weight load and gradually build up your weights. Weighted vest exercises drills are effective for building bone bone because they increase the load on your bones and muscles as you exercise. In this video blog, I will cover different types of exercise you can do with a weighted vest. I have also discussed whether you should use a weighted vest for backpacking and provided tips on weighted vests. Good form is essential when you exercise – whether you are using weights, a weighted vest for osteoporosis or free of any accessories. Before you incorporate a weighted vest in your exercise program, make sure that you are able to maintain good form without the weighted vest. Give them a try! But make sure you have progressed to this level. Hi, I’m Margaret Martin at MelioGuide, and today I’m here to bring you some suggestions and ideas to use your weighted vest when exercising. As you’ve heard me say many, many times before: whenever you introduce anything, whether it’s weights that you’re holding in your hands, or weights that you’re putting on your body, such as with the weighted vest, your form is what dictates how much weight you can hold or carry or workout with. You want to make sure that your form is always perfect. Any of the exercises that I’m introducing today, I’m going to assume that you know that you don’t introduce exercises with weights or weighted vests until you’ve done dozens and dozens of them without the weighted vest or without external weights. Let’s start with squats. Whether you started with chair squats, and you’re graduating to free squats, and whether you choose to do sort of a hip-width squat, or a narrow squat, or a wide squat, you want to ensure that your squats are in good form, that your knees are pointing in the same direction that your second toe is pointing in the whole time. A weighted vest is a great adjunct to squats, frees up my hands, allows me to start doing things like squat jumps. So, that’s a really nice use of the weighted vest. Another one is lunges. Great exercise, whether you choose to do a forward lunge, a lateral lunge, a reverse lunge, or you can do a combination, where you’re doing what’s called a clock lunge. So, if you can imagine me drawing the face of a clock. Twelve o’clock, one o’clock, watch my back foot and knee is pointing in the direction of that heel. And now lateral, where both feet are parallel to one another. Back to the four o’clock, again, back toe and heel are pointing towards the front heel. A six o’clock, and then switch it. And then finish the face of the clock. Again, you wanna have done these many times without the vest, and then you start adding the vest, and gradually increase the weight in the vest. Just as in weighted squat jumps, you could do weighted jump lunges. So, a jump lunge would involve lunging and going into a jump. The vest is a great adjunct. The simpler way of introducing a vest that we’ve talked about in the past is walking, brisk walking, step-ups, but simple jumps is another one. So with jumps, as in with your squats, knees pointing in, you want to ensure that you land with toes and knees pointing in the same direction, unlike landing that I often see with young basketball players. Starting your jumps on the spot, jumping forward, jumping back, jumping side, side. And if jumps are not in your repertoire of movements, whether it’s from arthritis of the hips, or knees, or just general conditioning, then one other nice thing you could do with your weighted vest is your heel raises. Starting with introducing the vest, if you’re doing double heel raises or single heel raises, both of which will make the transition into more explosive movement, the plyometrics easier by getting that explosiveness and strength in the calf muscles. So, I think that’s enough ideas for today on the use of the weighted vest for osteoporosis in your exercise program, and in helping you build bone through the hips and spine, and I’m gonna tune out. Margaret from MelioGuide. Have a great workout! Thanks for tuning in. A reader contacted me recently to ask my opinion on using a backpack with free weights instead of a weighted vest for osteoporosis while on her hiking trips. Dear Margaret, I have read your information on weighted vests for extra weight-bearing walking and I am wondering about a substitution specifically carrying a backpack loaded with free weights that could be stabilized with towels (or whatever) as opposed to the extra cost of these vests. I suspect that the positioning of the weights is critical for most effect. Thanks in advance for your opinion … I so appreciate the resources that you give. Here is my response to her inquiry. Here is my opinion on the backpack versus a weighted vest for osteoporosis. Depending on the type of pack, it can provide the same benefits. Some backpacks are well designed and transfer a large percentage of the weight to the hips. This would reduce the load on the spine and so I would expect that you would have to carry more weight to get the same benefit as a weighted vest of the same weight. If you decide to wear your backpack, then I highly recommend that you use a sternal strap (linking the two shoulder straps together) to take pressure off the nerves and muscles in your armpit area. It also keeps the pack more stable. In so far as the type of weight, I recommend you try to load your pack evenly and with soft weights for two reasons: 1) to keep you more balance especially with hiking on uneven surfaces, and 2) should you slip back onto the backpack (the once in a lifetime but possible occurrence) then you will be cushioned rather than hurt. Hope this is helpful. Happy trails. (1) Effects of Exercise Training With Weighted Vests on Bone Turnover and Isokinetic Strength in Postmenopausal Women. Journal of Aging and Physical Activity, July 2007, 15, 287-299. This study was conducted by Panagiota Klentrou and Brian Roy at Brock University’s Faculty of Applied Health Sciences in St. Catherines, Ontario, Jill Slack with the University of Toronto’s Faculty of Nursing, and Michel Ladouceur of the University of Iowa’s Department of Exercise Science. Excellent post. I like your great topics to share, discuss and published here. I impress your great advice about weighted vests for Osteoporosis. I agree your Information. Thanks for your great struggle on this article. Thx – just gobbling up all your marvellous videos and blogs. I am in Toronto On and whilst we do have marvellous resources here, very few discussions go on except to recommend scrip meds and apply scare tactics to get you to take them!!! Thank you for your kind words, so glad you find the videos helpful. I loved learning pottery I hope you have as much enjoyment as I did. I do not recommend a vest or brace while working with clay. You would benefit from practicing hip hinging from a seated position, working with in a mirror is helpful. As well, when you receive my book you will find a link to my ebook that outlines modifications to day to day activities to keep your spine safe. This should help you reinforce good posture during you pottery classes. Lastly, keeping the clay close to your body and above the level of your pelvis will also keep your back in a safer position.